The site is the former GE Aviation facility on Wobaston Road, Bilbrook, approximately 5 kilometres north-west of Wolverhampton City Centre. 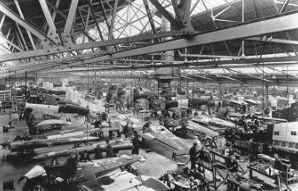 The site has had a long history with the aviation industry stretching back to 1938, when the site was initially developed by Boulton Paul Aircraft. During the Second World War period, Boulton Paul manufactured the Hawker Demon and the Defiant aircraft. In addition, also built the Fairey Barracuda and undertook conversions of the Vickers Wellington. Post war saw the development of the Balliol advanced trainer. During which time the facility manufactured flight controls for aircraft, including the RAF Typhoon jet fighter, Boeing 777 & 787 and the Airbus A330 & A380. Through a number of acquisitions and take overs the site name changed several times. Later becoming Dowty Aerospace, Smiths Group and more recently GE Aviation. The site has been recently purchased by Seconique with the view of relocating their furniture storage and sales facility to the Wobaston Road site, together with leasing out a number of the remaining units. To the West of the site is the Shropshire Union Canal forming the site boundary. The reach of the Shropshire Union Canal closest to the site is classified as Grade B (good) under the Environment Agency General Quality Assessment Scheme in 2000. The River Penk is located approximately 30 m east of the site flowing south to north. According to the environmental database, the reach of the River Penk between Lane Green-Ford Houses Brook to Saredon Brook located 103 m north was classified as C (fairly good) quality under the Environment Agency General Quality assessment (GQA). Due to the decades of industrial operations at the site, a number of complex contamination issues remained. A key requisite of the vendor (GE Aviation) and the regulators (Environment Agency) was the requirement to address a number of contamination concerns highlighted by GE Aviation’s environmental consultants Ramboll Environ.